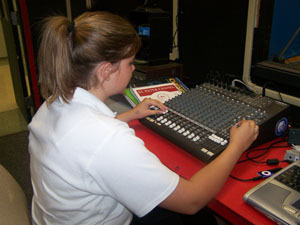 Our in-house closed-circuit television studio is a state-of-the-art facility completely run by students. In addition to producing the morning announcements and airing Chanel One, WCHS members have created specialty videos to celebrate the achievements of various sports teams. 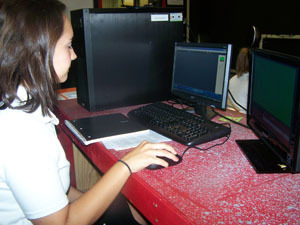 In addition, the studio staff is responsible for the production of a video paying tribute to each year's graduates. This video is unveiled for graduates and their families at the Baccalaureate Mass in May. 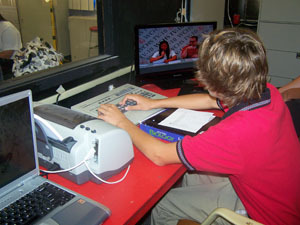 Any student may join the television studio. Is your son or daughter having a special day? Is a birthday coming up? A big game? A huge test? Now you can offer greetings or a special message. WCHS is offering parents and students the opportunity to send a message to a student through the WCHS morning announcements. All you have to do is fill out the form below. Include your name, the name of the student to receive the message, the date you want the message to appear, a message of no more than 40 words (all wording must be appropriate for a school broadcast. Inappropriate wording will be deleted or modified), and a check (made out to St. Peter Chanel) or cash for $5.00. Please make sure we receive your announcement at least 3 days before you want it to appear on the air. Our announcers will make sure your son or daughter hears your special message. Thank you for helping to support WCHS through your message! We need your help in saving the environment and in helping our school newspaper, The Flame, and WCHS, our TV studio, prosper and expand. All you have to do is bring your empty laser and inkjet cartridges to the recycling boxes located in the main office of the school and in room 207. We receive cash for the cartridges, which will then help The Flame and WCHS purchase much needed equipment. Please check with your places of employment as well to see if they are willing to donate their cartridges. We can even arrange to have a box placed at a work location for easy drop off. You can send cartridges in with your student or drop them off in the main office yourself. Thank you for your support which will help improve the quality of both The Flame and WCHS.